The President of the Senate, has released a statement announcing his decision to attend his trial athe Code of Conduct Tribunal yesterday. The Senate President, Dr. Bukola Saraki will appear before the Code of Conduct Tribunal tuesday 22nd of September 2015. 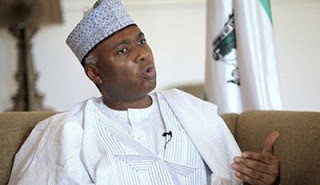 While the Senate President, Dr. Abubakar Bukola Saraki had stated and maintained that he is ready to submit himself to due process of the law on any issue concerning him, he also believes that he has an inalienable right to resort to the same Judiciary for protection when he feels his fundamental human rights are about to be infringed upon. The Senate President is a law abiding citizen and his absence from Tribunal was based upon legal advice he received from his counsel that it is not necessary for him to appear before the tribunal at this stage since the jurisdiction of the tribunal and the process of initiating the matter are being challenged before the Federal High Court Abuja. Following the adjournment for the determination of the motion on notice and the substantiative suit before the Federal High Court to 30th of September and the appeal pending before the Court of Appeal adjourned to the 29th of September 2015, the Senate President has decided, as a law abiding citizen to appear before the tribunal in the Interim. Dr. Saraki has taken the decision to attend the Tribunal sitting to demonstrate his respect for the rule of law in spite of his personal reservation on the process of his trial and the purpose it may be intended to serve. Dr. Saraki wishes to assure Nigerians of his believe in the Judicial process and is therefore confident that the course of justice would be served at the end of this matter. Media Office of the Senate President, Federal Republic of Nigeria.